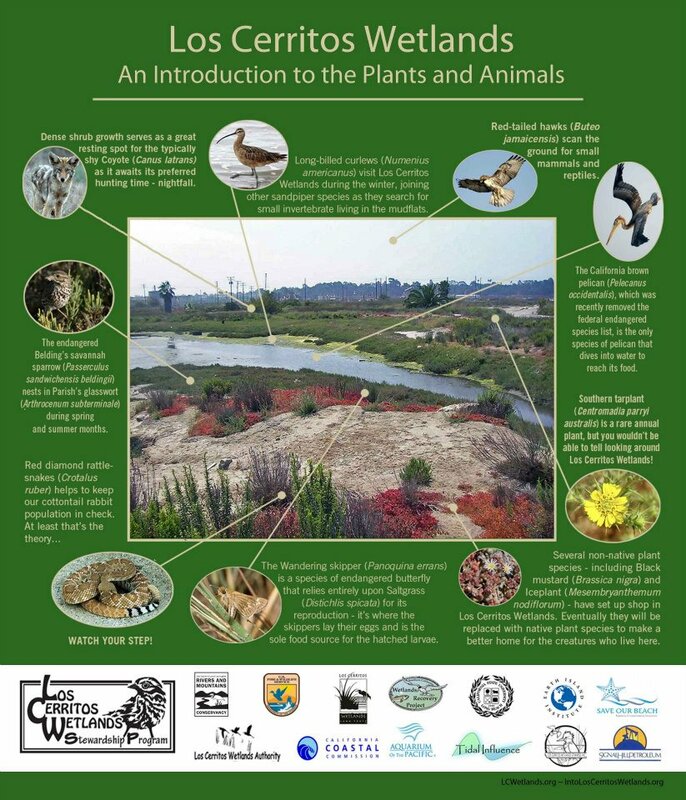 Los Cerritos Wetlands Land Tours stroll through heritage coastal sage scrub and historic dredge spoils, while looking for wildlife. 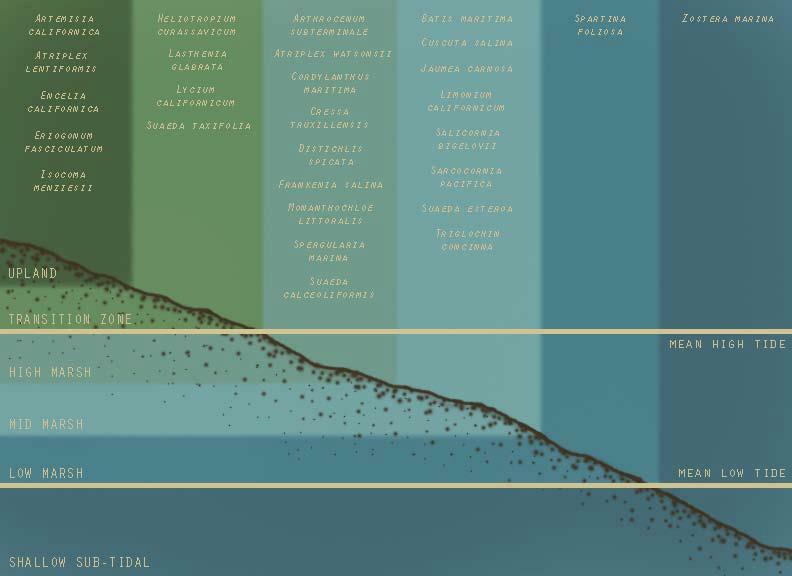 Participants often see tiger beetles, coyote tracks, green sea turtles, and special status birds. LCW Land Trust Tours are 8:00 am – 10:00am on the 1st Saturday of each month. Meet us in the driveway near 1st street and PCH, Seal Beach. See LCWA's flyer for further information. Service-learning trips are provided for high school and college classes to provide an introduction to restoration, conservation and participate in a hands-on restoration project in the wetlands. Contact iwanttohelp@tidalinfluence.com for more information on scheduling a trip for your students. Special summer tours are conducted for underserved youth groups from urban areas in Long Beach. For some youth this is there first experience with wild land. Participants tour Los Cerritos with binoculars and track coyotes and learn about the native Tongva people who used their surrounding natural resources. Contact Elizabeth Lambe for more information. Bird Walks are available on select Sundays year-round. To make a request for a group, or for more information contact education@coloradolagoon.org. Field Trips are available for hands-on exploration of Colorado Lagoon led by experienced naturalists and Lagoon educators. To inquire about scheduling a field trip or for information contact education@coloradolagoon.org. Science Shack is a hands on program for all ages with an interactive touch tank aquarium, wild specimens, scavenger hunts, beach seines, wildlife capturing activities, and knowledgeable naturalists. 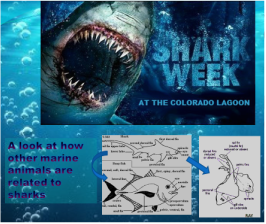 Many weekends will have exciting themes such as shark week. Naturalists will facilitate the program and can answer any questions regarding the lagoon restoration phases or local plants and animals.Contact education@coloradolagoon.org to learn about next summer's programming. Learn about fish, birds, plants, and Native Americans through the exploration of our outdoor classroom. K-12 and college trips are welcome and available upon request. Contact Tidal Influence to schedule a field trip. Available upon request. Contact Tidal Influence to schedule a company or group educational event. To learn more about Los Cerritos Wetlands and the Colorado Lagoon, visit these websites http://www.lcwlandtrust.org/ http://www.intoloscerritoswetlands.org and http://www.coloradolagoon.org/.